The Raglan Hotel still exists today and is situated on the main intersection in Axedale. Today it is a home and also home of The Axedale Gallery. 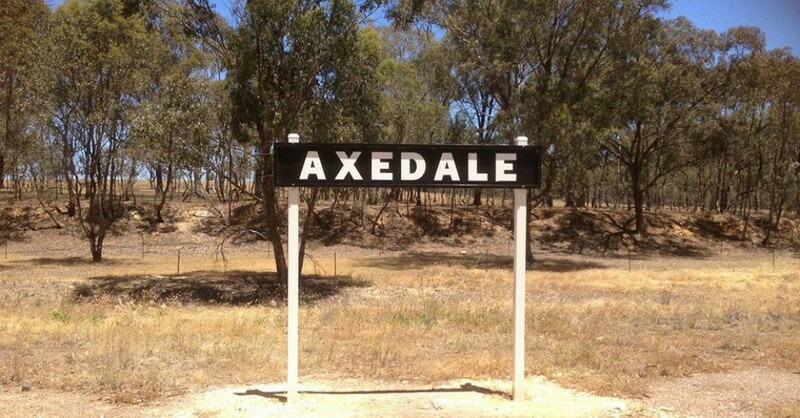 “The village of Axedale, situated on the Campaspe, about fifteen miles from Sandhurst, was on Monday evening the scene of a very serious disaster. The Raglan Hotel at that place will be well-known to old as well as modern travellers on the McIvor road. It was built, we believe, somewhere about the year ’55, and was a substantial little structure, the main portion of which was formed of 14-inch walls of stone and brick. This portion of it contained six rooms, but a wooden addition at the rear, of considerable size, intended for the purposes of a dancing room, on the occasion of the local races and other gala days, was divided into three apartments by means of shifting wooden and calico partitions. It was in this part of the hotel that a fire, which has reduced the whole fabric to ruins, broke out about six o’clock the night before last. No satisfactory explanation can be given of the origin of the conflagration. But we may here state that neither the house, which was the property of Mr. Doak, nor the furniture and stock belonging to the licensee, Mrs. Tierney, were insured. The fire, therefore, was the work either of a malicious incendiary, or of some of those mysterious agencies which form the grand chapter of accidents. From inquiries instituted yesterday on the ground, it appeared that the people of Axedale believe firmly that the fire occurred accidentally. Mrs.Tierney, with her son and daughter-in-law, had visited Sandhurst on Monday, leaving a man in charge, who was the only person on the premises, and as his duties confined him to the bar or front part of the building, he has no knowledge whatever of the cause of’ the unfortunate occurrence. There was not a fire in any room on the premises during the day. The fire was first discovered by a little girl, the daughter of Mr.Drake, of the Campaspe Hotel, which is situated immediately opposite to the old Raglan. She was crossing the street on some errand when she saw flames issuing from the back, wooden building, and she immediately gave the alarm. Mr. Drake, with several persons who happened to be in his house, rushed across the road, and the whole population of Axedale quickly gathered, on the spot. Every endeavor was made to save some of the property, but so rapidly did the flames extend that only some articles of small value, such as bedding and clothing, could be saved. Naturally, the first rush was made to the burning dancing-room, but the fire had taken such a hold of it that all attempts in that direction had quickly to be abandoned, and attention was directed to the saving of property in the front part of the hotel. 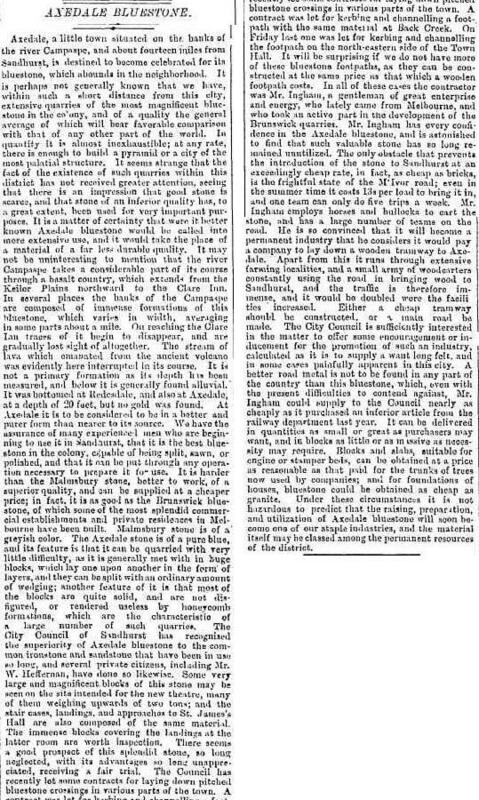 But the heat and smoke were so intense and suffocating that the people were driven back without effecting any great good. The spread, of the fire was so rapid, we were assured by eye-witnesses, that from the time of its discovery barely ten minutes had elapsed when all hope of extinguishing it or rescuing the stock and furniture was at an end. The main portion of the building was in the form of a half square, the dancing-room forming a third part of the square. The flames from the latter were driven by a smart breeze which was blowing at the time through the somewhat narrow second side facing the Campaspe, and thence into the bar and parlor side fronting the main road. It is to be understood that although the chief portion of the house was composed of solid walls of brick and stone, yet at the end to which the dancing-room adjoined the gable was formed of calico and wood, through which the fire rushed with great fury. But it is a little extraordinary that, although it had immediately to encounter a stone brick partition, it swept over it and another of the same description also, consuming the ceiling and roof. In these partitions there were no doors nor openings of any kind, but in a third one there was a door leading into the bar. It can be imagined with what force the devouring element swept through the narrow building and its partitions, when it is remembered that scarcely ten minutes had elapsed before every part of the house was one mass of flames. Within three-quarters of an hour the work of destruction was complete; the wooden dancing room levelled with the ground, the rest of the building completely gutted, the solid walls cracked and crumbling with the intense heat, the iron roof entirely collapsed, and the wooden part of the roof utterly consumed. There was a good dam of water close at hand, but it was found utterly impossible to make any effectual use of it. The hotel had been erected in a hollow, and the floors were raised very high from the ground, consequently the fire raged both above and below, and being confined within the solid walls of the somewhat narrow building, obtained tremendous force. How the accident could have been occasioned is a mystery which it is difficult to solve. The dancing-room in which it originated was almost empty, there being only a tarpaulin lying on one part of the floor, and a bag or two of wheat on another. This entry was posted in History and tagged Axedale, History, Raglan Hotel by Jennifer Jones. Bookmark the permalink.